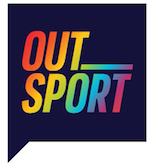 - Outsport - Play friendly. Play proud. Imagine yourself running, swimming or jumping while carrying a heavy sports bag with you at all time. Wouldn’t it be exhausting? For many LGTBI athletes, to live a life in sports feels exactly like that. In Europe only, there are at least 30 millions LGBTI people. Half of them have suffered verbal or physical abuse in a sporting environment. To stop this, we all need to change the way we play our games. Let’s start by leaving homotransphobia out of our sports bag and make some room for our diversity.